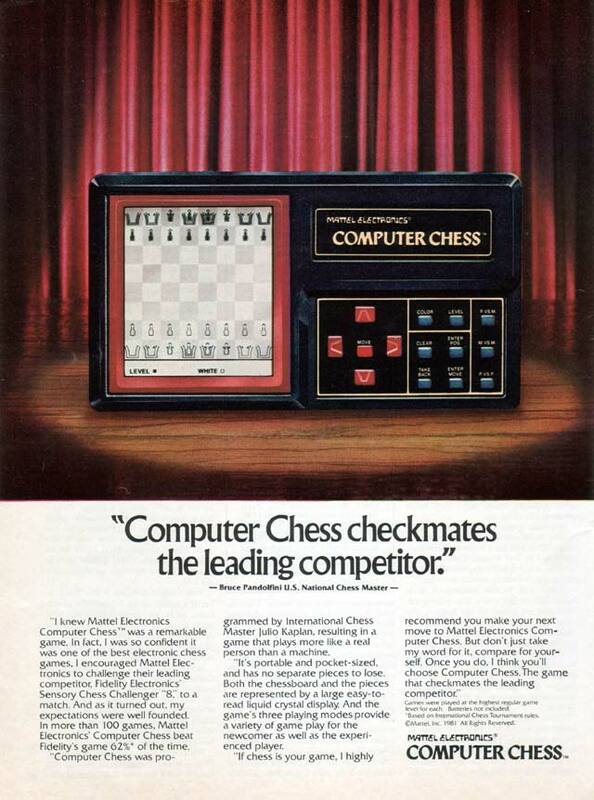 I believe this was the world's first LCD chess computer. There are no pieces or boards. Just the LCD screen and the buttons to enter the moves by selecting the pieces and placing them in the desired square. This was endorsed by US Chess Master Bruce Pandolfini. Mattel was originally founded by Harold Matson and Elliot Handler who created the name 'Mattel' from the beginnings of their last and first names. The company started out selling picture frames out of a garage workshop in 1945. Elliot started a side business of selling doll house furniture from the scraps of wood from the picture frames, and with the success of the doll furniture, the emphasis was turned to toys. Mattel started making electronic games in 1976 with the handheld Missile Attack game (which lived only a short time), and soon followed by Football and Auto Race. All are LED based games unless noted. Mattel has been re-releasing several of their classic games, look for the white re-release labels.